Peter Scott Lewis is a composer of considerable talents. ... solid construction ... strong rhythmic sections ... luminous ... ably performed by Kees Hulsmann and The Berkeley Symphony Orchestra ... under Stephanie Friedman’s flawless diction ... Robin Sutherland’s fine solo performance. San Francisco composer Peter Scott Lewis writes in an attractive tonal idiom that appeals to both the heart and mind. The music is euphonious and often disarmingly pretty, but with a core of strength that shows itself in surprising harmonic choices and vigorous instrumental textures. Where The Heart Is Pure: ... a thoughtful and varied song cycle to poems of Robert Sund. The vocal writing shows equal concern for the shape of the poetry and for the autonomous demands of melody, and mezzo-soprano Stephanie Friedman gives a beautifully crafted performance. Violin Concerto: ... with vibrant sections... receives a committed performance from Kees Hulsmann. Delicate Sky: an offbeat, charming trio, gets a finely wrought performance by violinist Nadya Tichman, percussionist Jack Van Geem, and pianist Robin Sutherland. The mood throughout is romantic without clichés, the writing contemporary without contrivance. The piece makes demands on the soloist in ways that are both exciting and rewarding, with fresh sounds deftly woven into the total fabric. Above all, it is an easy piece to listen to, yet one that promises fresh insights on rehearing. Particularly attractive was an ostinato figure in the orchestra during the second movement that provides momentum over which the violin unfolds a lyrical melody. Composer PETER SCOTT LEWIS uses the poetry of Northwest American poet Robert Sund to very different effect. Where The Heart Is Pure (New Albion) is sung by mezzo-soprano Stephanie Friedman and performed by the Berkeley Symphony Orchestra. Both composer and poet capture the misty shades of the Northwest hills in their music and words, and while this is in the "new classical" vein, it will nonetheless appeal to any audience with good ears and an adventurous spirit. Peter Scott Lewis is a west coast composer, now living in San Francisco... What you find is a serious, straightforward neo-romanticism, almost Bergian, without the Viennese master’s edge. Written in the mid 1980s, at the height of a flowering of concerto composition in the United States, Lewis’ Violin Concerto is a fine example of the genre. It is challenging for the soloist and accessible to the audience, without pandering or condescending. Kees Hulsmann gives a fine performance. The other pieces are also quite good, especially Delicate Sky for violin, piano, and percussion, which recalls a less dense and more colorful John Harbison. All of the performers are excellent, as are New Albion’s sound and packaging. 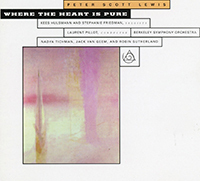 Peter Scott Lewis’ new CD creates orchestral music, joined by unique chamber music, blended in a careful manner. The first composition, Violin Concerto, is embellished with vitality and much calm. In contrast, Where The Heart Is Pure, a composition dedicated to Pablo Casals, the results are more rigorous and extroverted. In Delicate Sky, specially composed for this CD, the composer creates a climax with a simple and correct ascension. Lastly, Sun Music is a brief exercise for the piano, which is accentually dramatic.